While Aucklanders may be the brunt of jokes for those south of the Bombay Hills, we think living in the City of Sails is pretty damn rad. Stuck at the bottom of the world, we have carved a name for ourselves doing things our own way, and there’s no shortage of things to do in Auckland to keep us busy. Whether it’s our ability to complain relentlessly about Auckland traffic, our love affair with a great coffee, the way we’re too cool to acknowledge that IT’S LORDE SITTING AT THE NEXT TABLE, or how someone always knows someone who knows someone (making The Bachelor winner our worst kept secret)…. this fine city is a gem of a place to live. Great things to do in Auckland are thick on the ground, so it’s with great difficulty (although lots of fun), we’ve created our list of the top 50 things you should do if you live in Auckland. Cornwall Park provides some of the prettiest vibes in Auckland, with their lush greenery, spacious fields and seasonal cherry blossoms. Take a mat, some cheese, wine, family, friends and comments like, ‘we should really do this more often’. Speaking of cheese, were you aware that Auckland has been recognised internationally for our premium quality cheese? One of our faves include Puhoi Cheese Valley as they are home to some of the most indulgent triple cream brie you’ll ever taste! 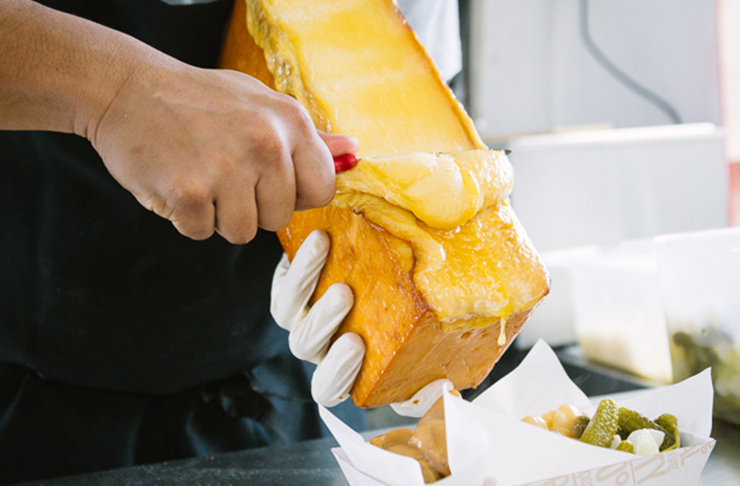 Puhoi Valley aren’t the only hub for the cheese lovers out there—check our list of Auckland’s Best Cheese Shops if you want to commit to a full tour. Take a ferry to Waiheke Island and visit some of the most gorgeous wineries and vineyards known to man. Mudbrick Vineyard & Restaurant captures all the rays of sunlight of Waiheke Island and has been shining bright since 1992. Other Waiheke activities include cycle tours, private food and wine tours, zip-lining and more! You don’t always have to get on a boat to another island to soak up the sunshine. Mount Victoria, located in Devonport, is one of the hot spots of Auckland, providing one of the best views of Auckland City. Whether you’re going for a daytime picnic or a glimpse of the sunset, pay a visit to the local fish and chips shop, take away some fried goodies and indulge with a view, true Kiwiana style. Take Auckland by feet and walk 16km from downtown Auckland’s Waitemata Harbour to the Manukau Harbour. The walkway passes through five volcanic sites, suburban streets and places of Maori and colonial history. The walk will take you about five hours and you can’t call yourself a true Aucklander until you’ve ticked this walk off your bucket list! Here’s a list of more of Auckland’s best walks and hikes. All around Auckland, you’ll find mysterious little black and yellow bikes in the most random places. Little did you know that anyone who downloads the OnzO App is allowed to take these bikes for a whirl for a pretty decent price! Cycle around Auckland, some great tracks would be from Auckland City to Mission Bay or just around the waterfront. Every year, Aucklanders are given a chance to run one of the best courses this city has to offer at the ASB Auckland Marathon! It’s not every day you get to run across one of the biggest landmarks of the country so hop on it! We all have one of those days when we just don’t know what we’re in the mood for. The hot sunny weather screams beach day but your heart just wants to do some retail therapy and expensive wining and dining. Mission Bay is an absolute waterfront haven with its local beach with boutiques and top eateries just a few steps away. This way, you get the best of both worlds! With top New Zealand designer stores such as Zambesi, Trelise Cooper and Karen Walker, international brands like Chanel and Tiffany & Co, Britomart will make you feel like you’re living your best life. Don’t forget to have a feed at one of the eateries situated in Britomart which are recognized as some of the top restaurants in our town. Some of these include Amano, Ortolana and Ostro and they are called the best for a very good reason. 11. Pinky’s Up! It’s High Tea Time! Something about those premium little sammies and cakes gets rid of our filters and spill our deepest secrets! Take along a friend or family and converse a long session of indulging and freshly brewed tea. 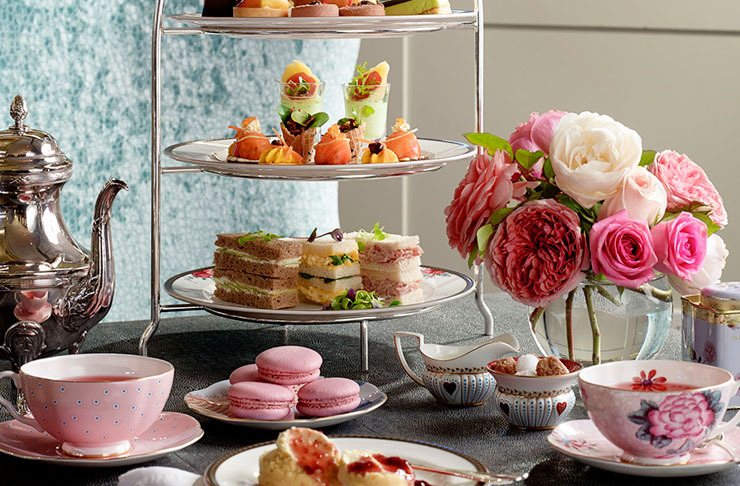 Here’s a list of the best high teas in Auckland. Every Aucklander has felt that thrill when they hear the sound of Greensleeves and it escalates as the vehicle of magic comes closer and closer. Don’t be shy to channel your inner child and sprint out the door, bare feet and chase down Mr. Whippy. The Giapo Kitchen churn out gelato on the daily and they have made a name for themselves over the years for being not only the best gelato joint in Auckland, but the world, which explains the long lines outside the parlour every single day. We don’t need to catch a flight to France for tasty treats as some of the dessert parlours in this very city do it just as well. For macarons, petit gateaux’s or a dessert degustation, head on over to our faves Miann or Milse. 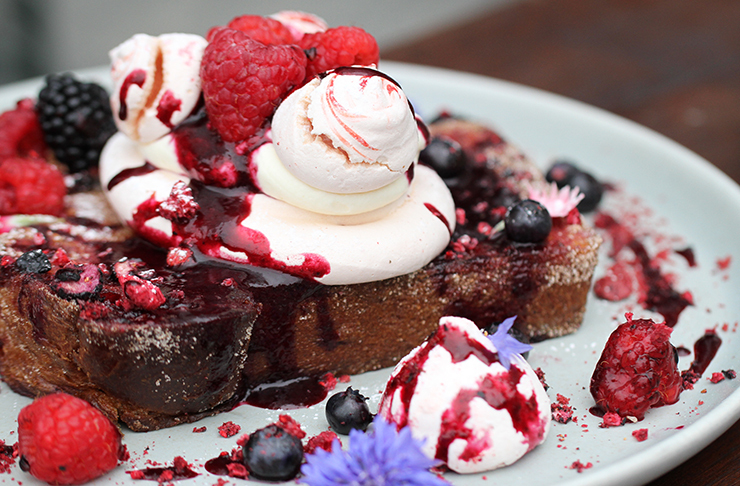 For all the sweet tooth’s out there, we’ve actually cracked down a list of Auckland’s best desserts. BYO stretchy pants. Dessert isn’t the only way to wrap up a good night! Trade in the slice of cake for an immense amount of lols at the laughing hub of Auckland, The Classic Studio. Always coming out with new shows and ways to tickle our funny bone, a night at The Classic Studio is a must for all Aucklanders. Enjoy a slice of France at the La Cigale French Markets located in Parnell every weekend. Aucklanders are treated to ultimate French morning market vibes with Edith Piaf singing in the background, artisan cheese stands, pastries fresh out of the oven, made-to-order crepes and endless amounts of fresh produce. Weekend morning markets are actually a big thing in Auckland so here’s a list of Auckland’s markets you must visit! Spend your day outdoors chilling in the sun at Silo Park. The waterfront view and industrial designs are contrasted with vines of greenery and the park is surrounded by cafes and eateries. 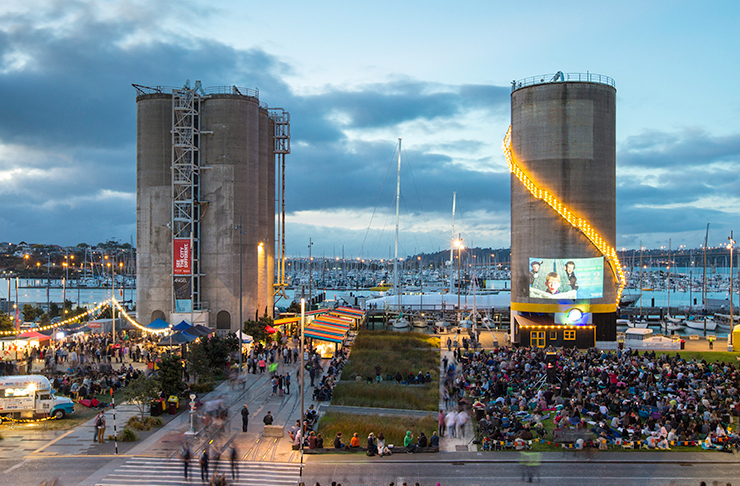 Silo Park really takes things up a notch during summer with their events, so keep your eyes peeled for those. This list would go well over 50 if we had to name all our favourite cafés as there are just too many to choose from but some of our faves include La Fourchette, Williams Eatery and Winona Forever. Before we get carried away, here’s a list of Auckland’s best cafés. New Zealand chef Al Brown has been taking over Auckland with his popular eateries that serve up absolute yumminess. If you’re lucky, you’ll even get to see the celebrity chef himself working his magic at one of his restaurants! These include, Best Ugly Bagels, The Depot and The Fed. The days of musical acts skipping out on New Zealand are in the past as we’re almost always included in their tour list now! The Civic has hosted some of the hottest musicals in the world such as Wicked, Mamma Mia, Annie, Matilda and Phantom of the Opera. You don’t have to pay to see the exquisite art this city has to offer! Make your way to The Auckland Art Gallery and spice up your life with some creativity. From classic paintings to modern pieces, there’s something for everyone at this Auckland hub of culture. New Zealand is renowned for their strength in rugby which gives us no excuse to skip out on a chance to watch a live game at Eden Park (NZ’s largest sports stadium)! Even if you’re not a huge rugby fan, channel the inner Kiwi and find some love for the sport. Trust us, the screaming crowd and cheerful vibes will get you so in to it. Cork & Canvas let you release your artistic side and get a little tipsy while you’re at it! This fun and friendly environment is a must for all Aucklanders so get your brush and let the wine stimulate some deep emotions for your upcoming masterpiece. Coco’s Cantina has a zesty vibe that has become one of the hottest spots for the socialites in Auckland. From Monday to Friday, Coco’s serve $13 pasta from 5pm to 6pm so you can feel like a high profile Aucklander while paying a low price! The White Lady is up all night serving up greasy goodness from their freshly made burgers, hot dogs and grilled cheese sandwiches. A night out isn’t complete without one of these bad boys! Eat Auckland Tours provides some of the best food tours to give us a taste of different cuisines and take us on a journey through different cultures. We’re talking Korean food tours, dumpling tours, spice of India tours and more! This Auckland road embodies artsy, hip and mod. Head on over to K’Road and take a look at some of the many op shops and search for vintage pieces. Make a stop to Bestie Café in St. Kevins Arcade and grab their infamous flat bread for lunch! If you hate it when people have the same thing as you, Junk & Disorderly is the place for you. Get yourself a vintage and rare artefact to add to your humble abode that will be a topic to talk about no matter which guest you invite. The cake master Jordan Rondel hosts masterclasses every now and then at her bakery—The Caker. Not only do you get to listen in on the tips, tricks and Jordan’s secrets of baking a perfect cake but you get to make one yourself to take home! Auckland has a large Korean community which might explain the reason to why there are so many Korean bars in this city! Spend a night, Gangnam style with some Korean fried chicken and shots of soju (this stuff is strong so beware). Some of our fave bars include Pocha, Twelve and OBar! 31. Pretend You’re Not Starstruck | Play Cool! We’ve all had that moment of coincidentally sitting next to someone famous. Whether they’re someone from Shortland Street, Married At First Sight or international superstars Lorde and KJ Apa, it’s cool! Just remember that Kiwis are relaxed, they’re chill, don’t let the fan girl take over you! If you’re not a morning person and getting up bright and early on a weekend is not an option, hit up the night markets! Auckland Night Markets features stalls cooking up tasty food of all cuisines from Mediterranean, Thai, Chinese, Vietnamese and more! You can’t call yourself an Aucklander until you ‘gram a photo of you walking along the Lightpath (a.k.a., the pink path). Whether it’s in the day or night, the Lightpath provides scenic views of our beautiful little city. Auckland does some bomb smashed avocado but it never hurts to try a little something different and brunch out the Chinese way. This multicultural city is spoilt when it comes to yum char restaurants. One of our faves is Sun World Chinese Restaurant in Newmarket as they do the best xialong bao’s and sesame balls! 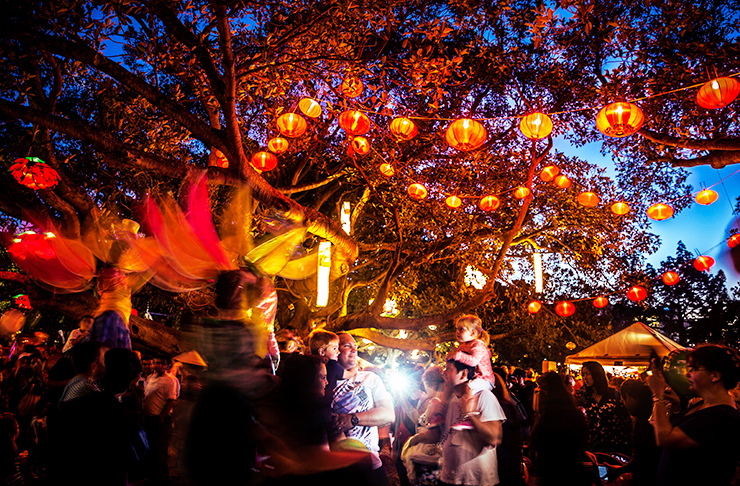 Speaking of Chinese culture, you need to attend a Lantern Festival at least once if you live in Auckland. It gets better and better each year and how can we say no to authentic BBQ pork buns?! Another festival that embraces the multi-cultural aspect of Auckland is the Diwali Festival. From henna’s, local Indian food, live performances and lights, this firey festival is an absolute must for all Aucklanders! Stanley Bay Wharf is where the local kids of Devonport spend their summer days. The wharf is heated by the hot sun which makes it a perfect tanning spot and when you need to cool down, take a leap of faith into the water. Aucklanders don’t need a boat to catch some fresh fish. Take a chair to Shelly Beach Wharf, sit back and wait for those suckers to bite on your hook for the freshest dinner to take home. You can’t call yourself an Aucklander if you haven’t stood in line on a Wednesday for Orleans special creation for just $12! 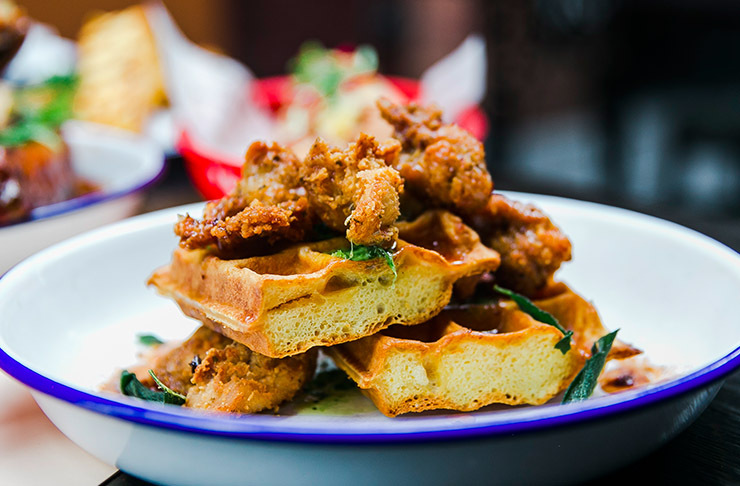 These waffles are topped with crispy fried chicken and the shake changes monthly and they taste the bomb every damn time. Flash City located in Ponsonby is a walk-in only barber and tattoo parlour that has grown to be an Auckland icon. Keep your eyes peeled for Flash Day as they offer beautiful and unique designs to take off the wall so feel free to live the YOLO motto to the fullest and get inked! You walk in to Source Bulk Foods, having promised yourself before that all you’ll buy is steel cut oats and some tamari almonds but walk out with chocolate covered raisins, matcha powder, cacao nibs, ten bottles of kombucha and moon macadamias… Oops. Lonely Lingerie stores all provide absolute class with their display, candles, service and even the smell of the store seems expensive. Roam around, feel up some of the fabric, maybe take some off the rack and put it against yourself in front of the mirror and then pull out that credit card. Go on, you deserve it. Deck yourself out in all Lululemon when the only exercise you have planned is the walk from your car to the café. Something about sports gear just makes you feel like you’re living your best life. If you and your mates haven’t already made your way to the Timezone on Queen Street and hit up the Japanese sticker photo booth ASAP. Pimp your photo up with a funky background and glittery font to add that kawaii element and keep it forever! Auckland has been going at it with the Asian fusion cuisine these past couple years but we can assure you that these guys did it first and they do it RIGHT. 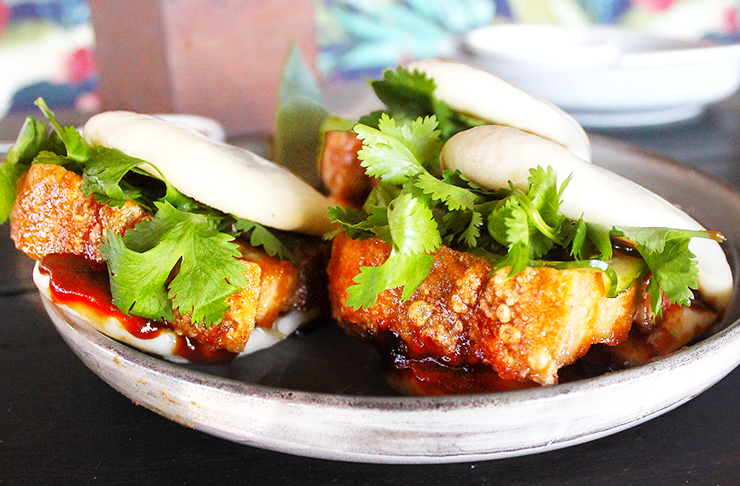 Every foodie has The Blue Breeze Inn on their agenda for their infamous pork belly bao’s! Either gift them or receive them, you can’t call yourself a Jafa without having chomped down on one of these indulgent treats from Petal Cupcakes. So simple yet so delish, these floral delights are always floating around the Instagtam feeds of Auckland and have turned in to the go-to gift. You begin to realize that mussels in New Zealand are bigger, juicier and all round better after experiencing measly little nibbles they refer to as mussels overseas. Head on over to The Occidental and order a generous pot of hot and delicious mussels. Pair that with a glass of cherry beer—Belle Vue Kriek and you are set for a good time. We all love a good hit movie on the big screen but watching an indie film on a smaller screen and classic cinema theatre is an intimate experience you should definitely get amongst. Thankfully, Auckland has a lot of movie theatres to make this possible! Some of our faves are The Captiol, Academy Cinemas and Matakana Cinemas. The Auckland Domain Winter Gardens deserve more than your iPhone camera as there are toooo many Instagram opportunities that have the chance of going viral at this spot. Take your leap of faith to new heights and jump off the highest point of Auckland—The Sky Tower. This way you can say you know the city better than anyone as you’ve seen it all with your own eyes. Quiz: How Auckland Are You? Image Credit: Lydia Arnold, Lauren Matilda Matthews, Jaiden Bhaga, Andrew Wilson, Silo Park, Auckland Lantern Fest.